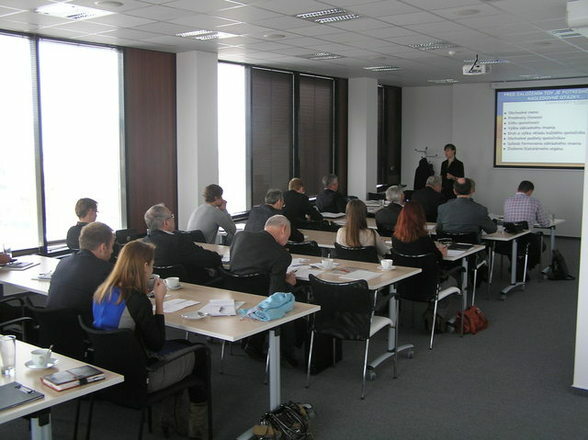 On November 28, 2013 in Bratislava, Slovakia, Helen Vishnyakova and Ilja Rogac of the International law firm Čarnogurský & Vishnyakova ULC have held a seminar about investment environment and peculiarities of doing business in Ukraine for Slovakian businessmen. The heightened interest of participants of the seminar indicates that growing trade market in Ukraine still remains one of the most attractive places for investment of neighboring countries, including Slovakia. The seminar addressed the benefits of investment environment for the foreign investors in Ukraine, and the most successful cases of Slovak entrepreneurs investing in Ukraine have been analyzed. Also, participants of the seminar received practical information on how to enter the Ukrainian market and the opening company in Ukraine, the export-import to Ukraine and other useful matters. Helen Vishnyakova and Ilja Rogac also shared with the participants about the special features of the business environment and business culture in Ukraine, as well as ways to minimize the risks for foreign investors in cooperation with Ukrainian partners. Thus, during the seminar was possible to obtain not only theoretical information but also to learn practical "subtleties" of doing business in Ukraine by Slovak entrepreneurs. Each of the participants were also given the opportunity to receive answers for interesting questions relating to their direction of business or personal situation.